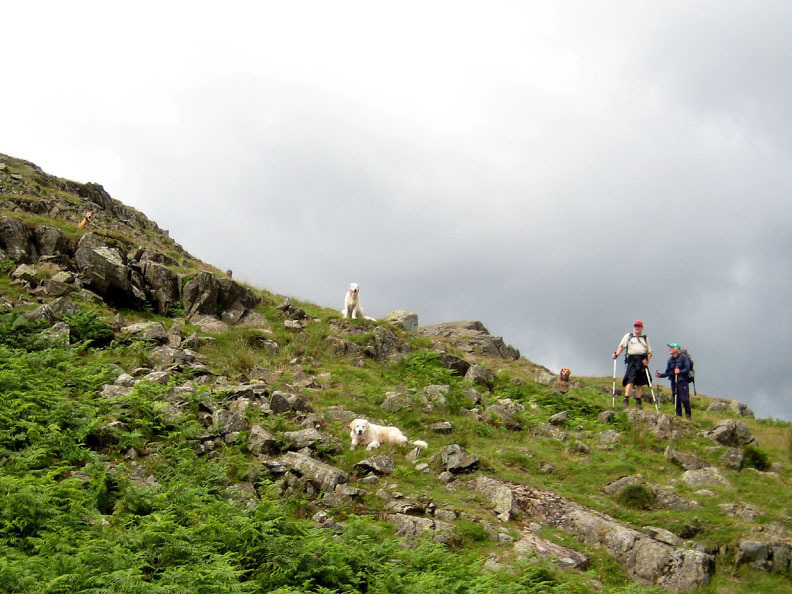 " Tarn Crag and Blea Rigg, Easedale"
Date & start time: Thursday 21st July 2011, 10.40 am start. 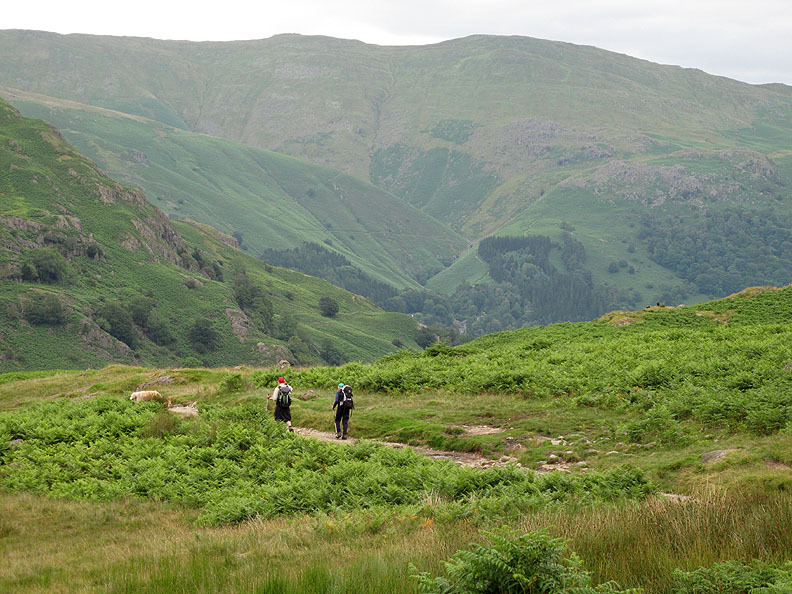 Places visited : Grasmere village, Far Easedale, Tarn Crag, Codale Tarn, Blea Rigg, Easedale Tarn and back through Grasmere. 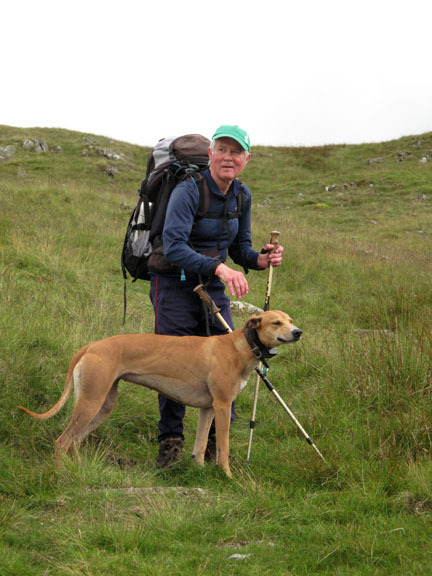 Walk details : 9.1 mls, 2260 ft of ascent, 7 hrs 20 mins. 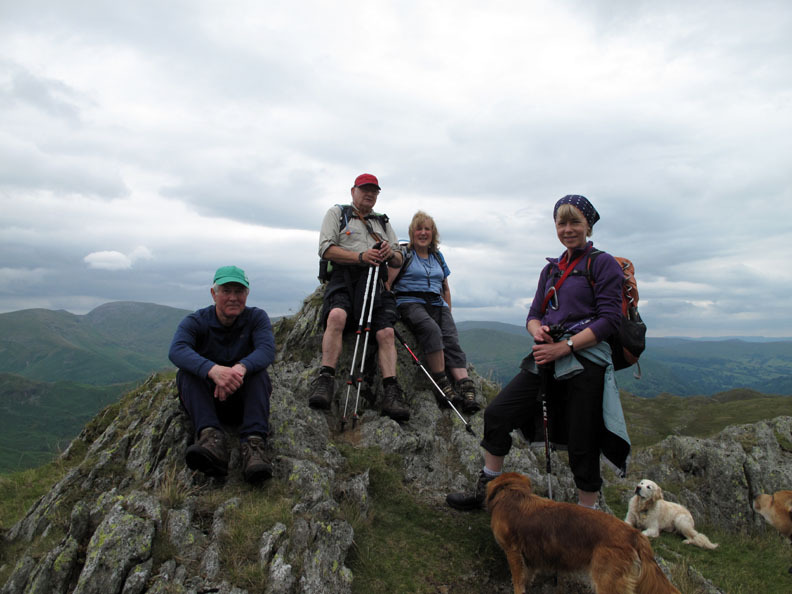 Highest point : On the ridge above Eagle Crag, 1825 ft - 562 m.
Walked with : Jo, John, Keith (Burton), Ann and the dogs, Amber, Polly, Harry and Bethan. Weather : Overcast but dry. Warm and humid to start. 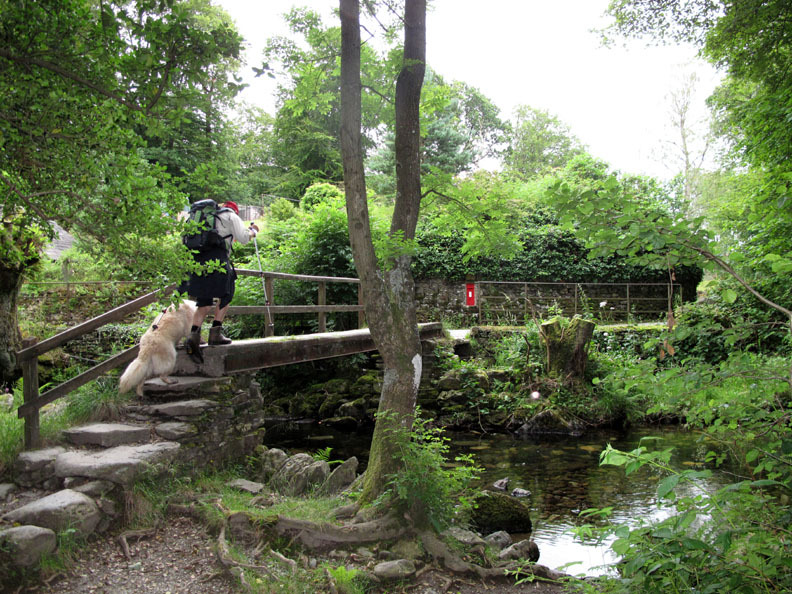 A surprise meeting with Keith at the layby in Grasmere meant that we were five for today's outing. We haven't been to Tarn Crag and Blea Rigg for quite a while so it was a welcome return to Easedale, even if the weather wasn't brilliant. Keith was planning a similar route so we joined forces for the day. 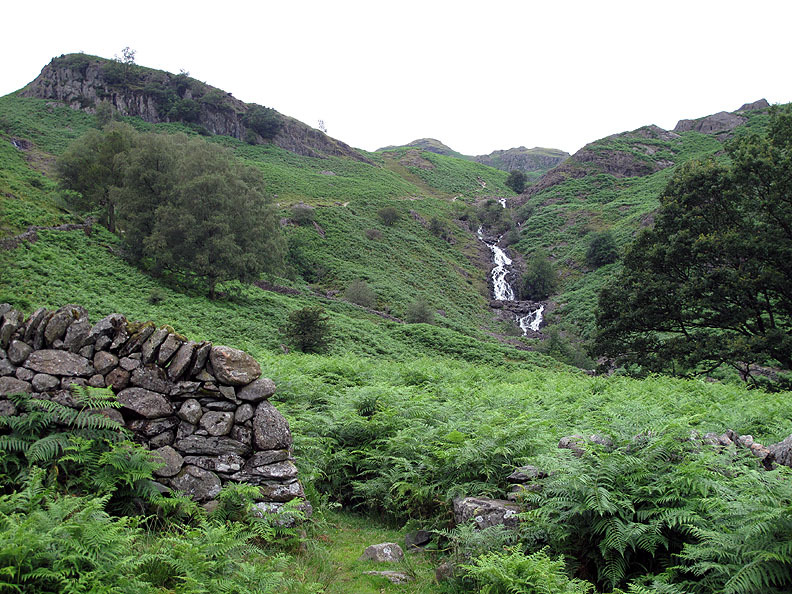 we emerged into Easdale Valley and had our first view of Sour Milk Gill with Tarn Crag behind. 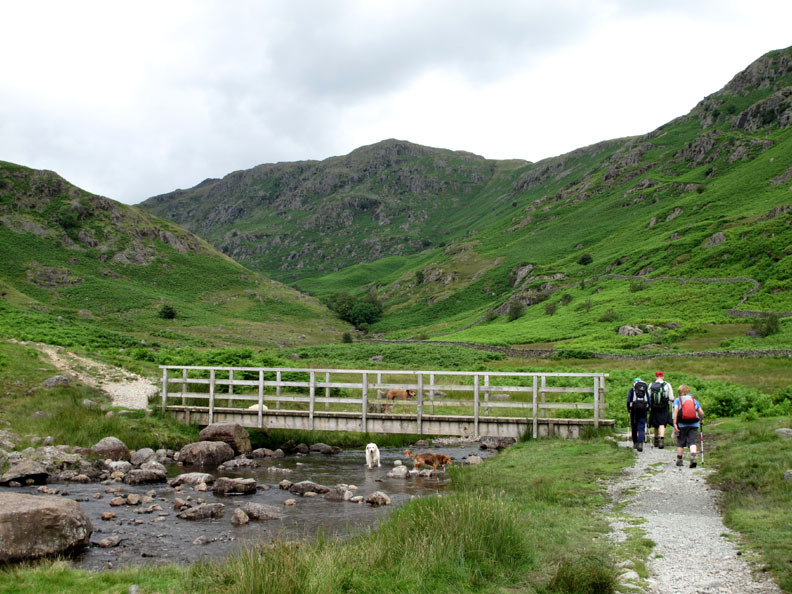 To make an anti-clockwise round, we set off up Far Easedale, crossing at the bridge at Stythwaite Steps. Keith is a fellow OFC member, seen here with Jo's dog Amber. 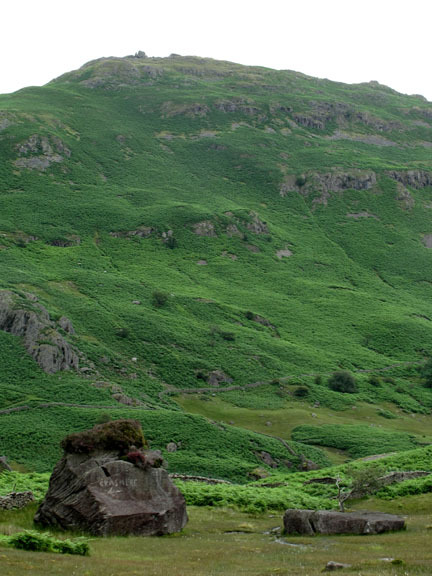 Helm Crag and the boulders in Far Easedale. 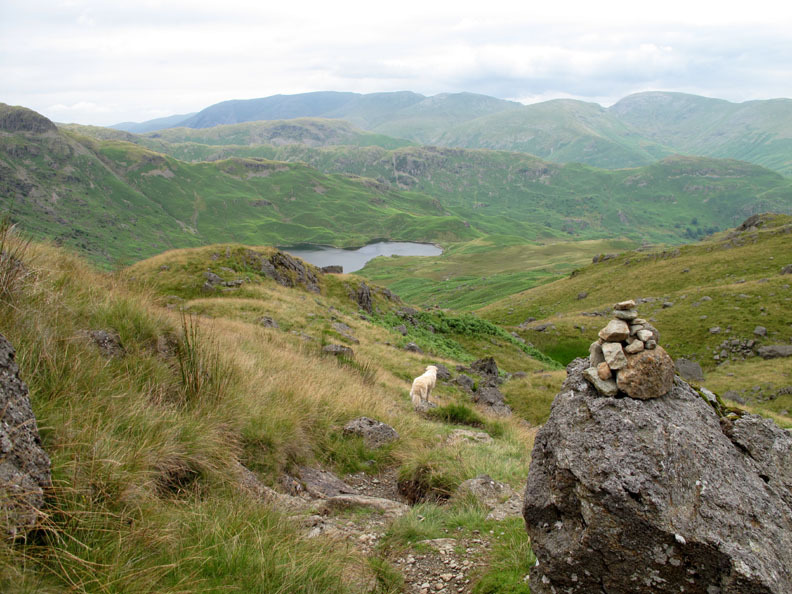 One of the boulders has a painted sign, pointing the way to Grasmere via the bridge we had just crossed. The other has been split in two and from the centre a reasonable size Rowan tree is growing. A walk across to study them close up can be a damp affair after rain so be warned ! We declined today. 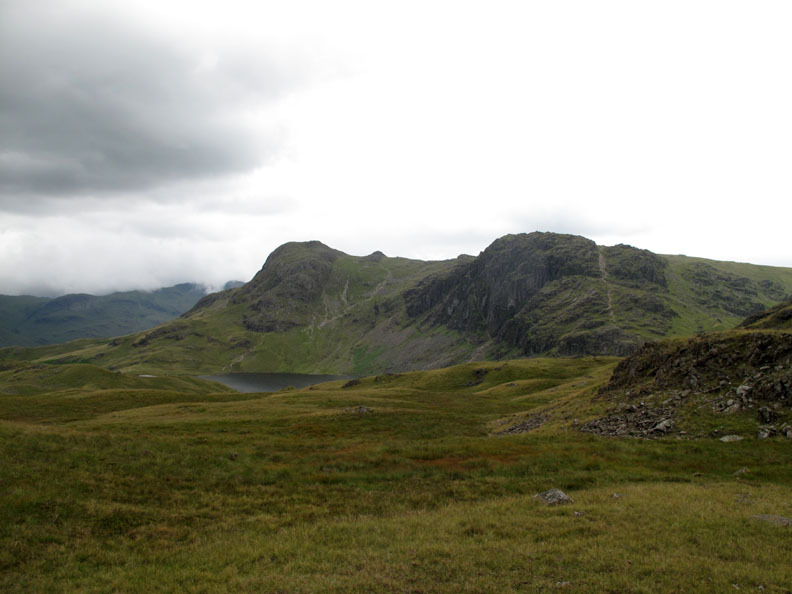 Subtle route planning with the map discovered a path up the ridge towards Greathead Crag and on to Tarn Crag. 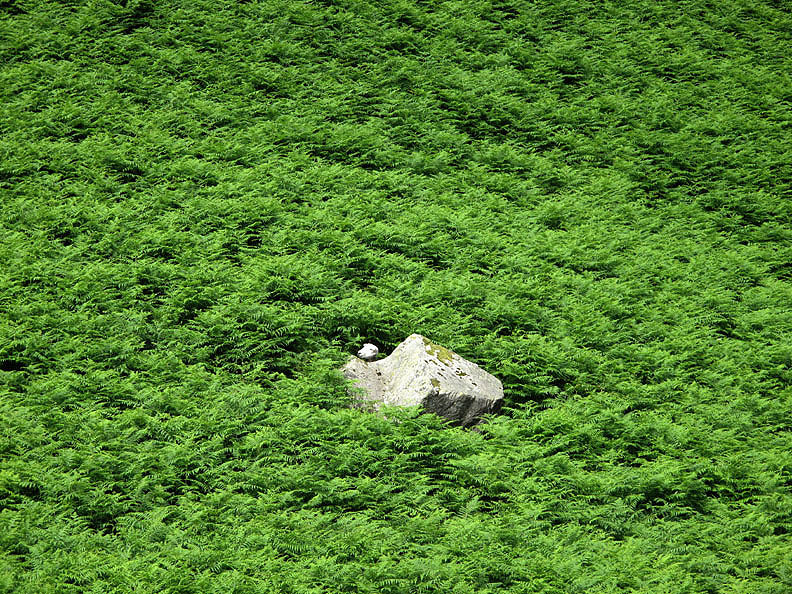 It was a little more difficult to find on the ground due to the strong growth of bracken. That's a funny looking stone over there ! Hold your cursor over the picture to see the truth of the matter. A view back as we make our way up the path through the bracken. 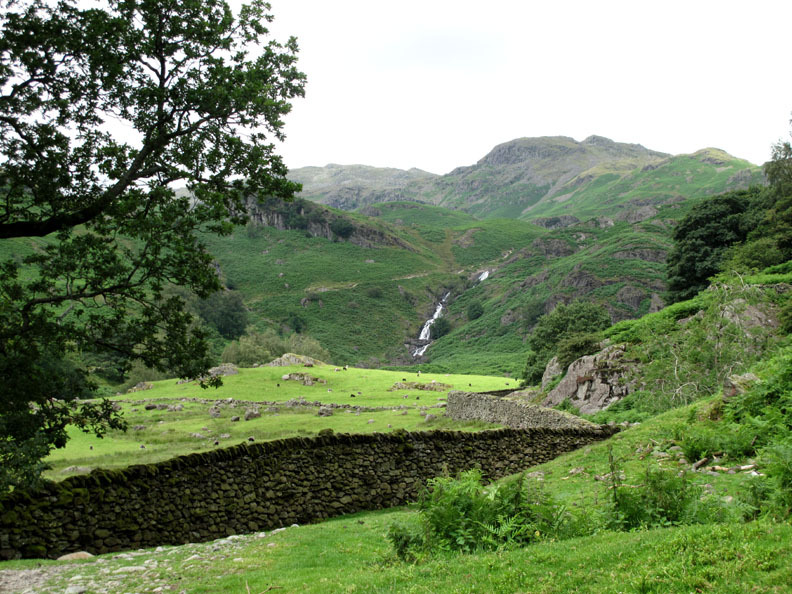 The valley is coated in summer green and the humidity seems higher due to the vegetation. It became cooler and more pleasant as we climbed above it. 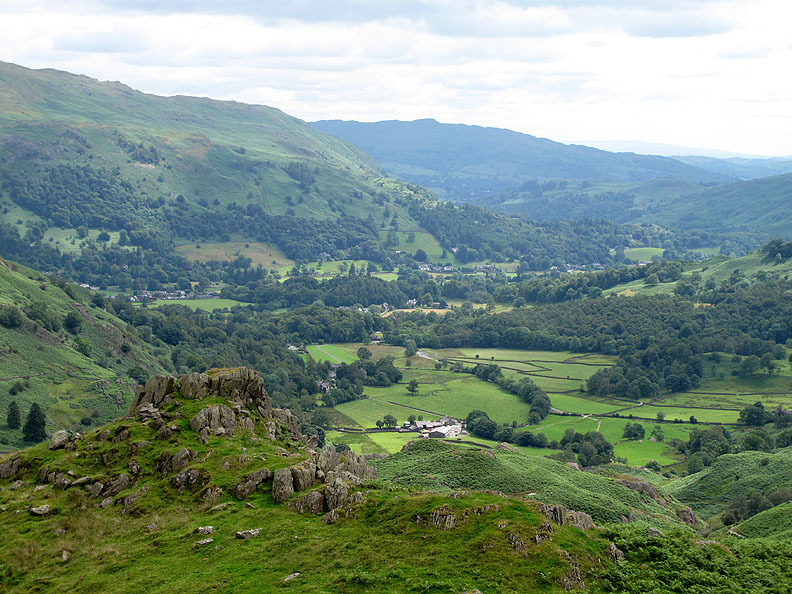 The small rock pinnacle of Greathead Crag, looking back down on Grasmere Village in the trees. 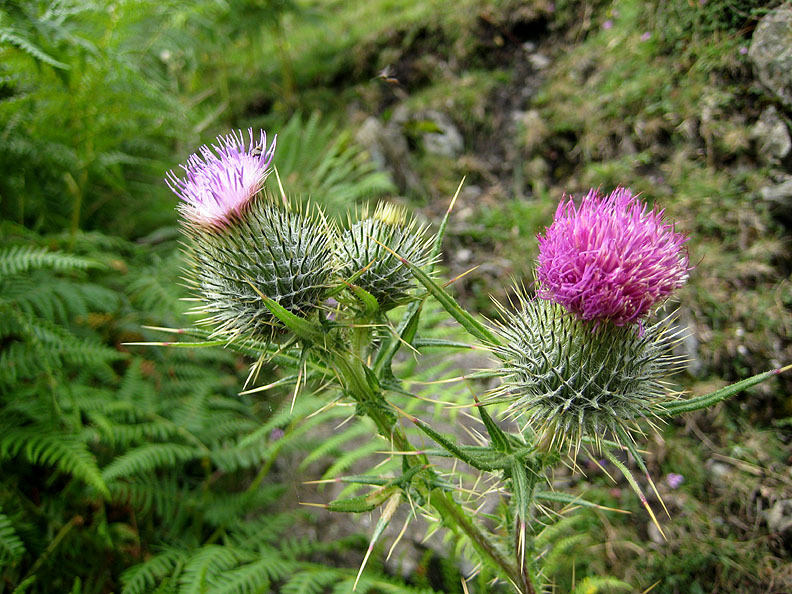 I'm sure I detected a subtle change in the conversation to more Scottish accents as we passed these magnificent flowering thistles ! we looked back to find we were being watched by six pairs of eyes. On this side we were only being watched by three ! 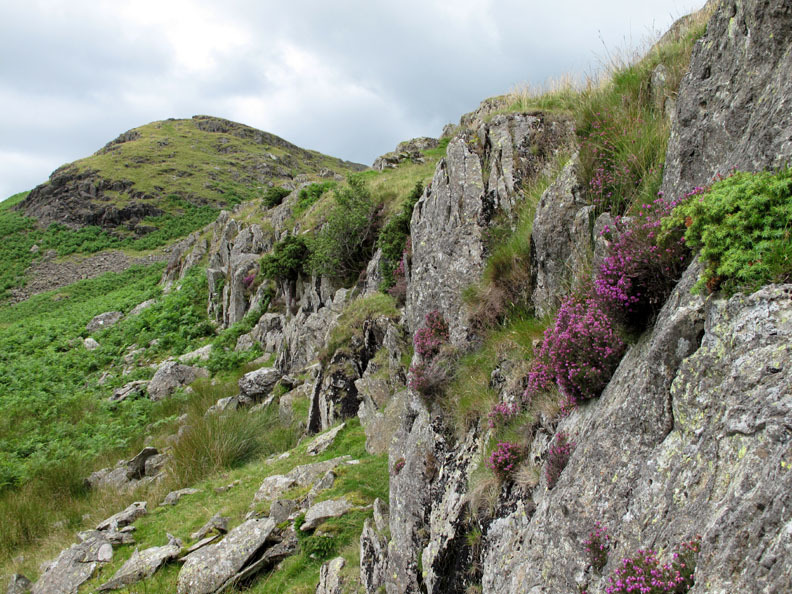 we passed this small rock outcrop with patches of beautiful heather in bloom. 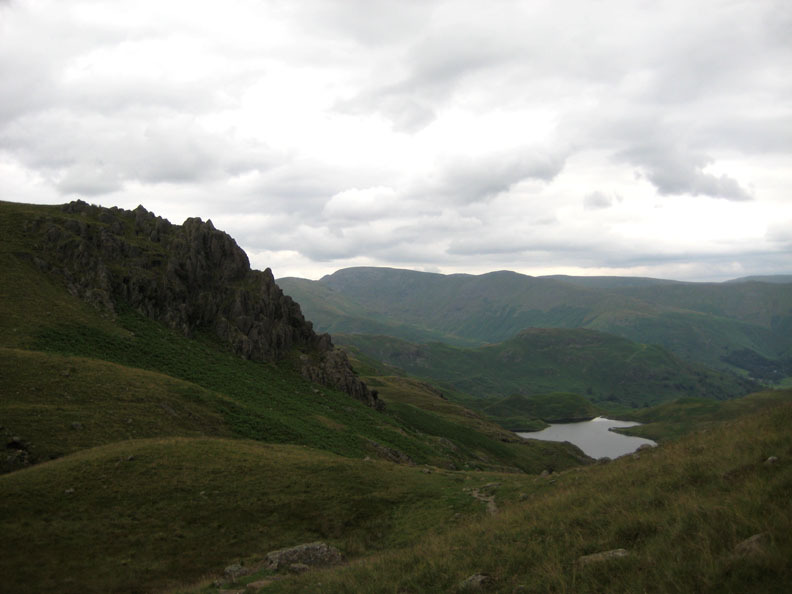 Our first view of Easedale Tarn from the climb up Tarn Crag. 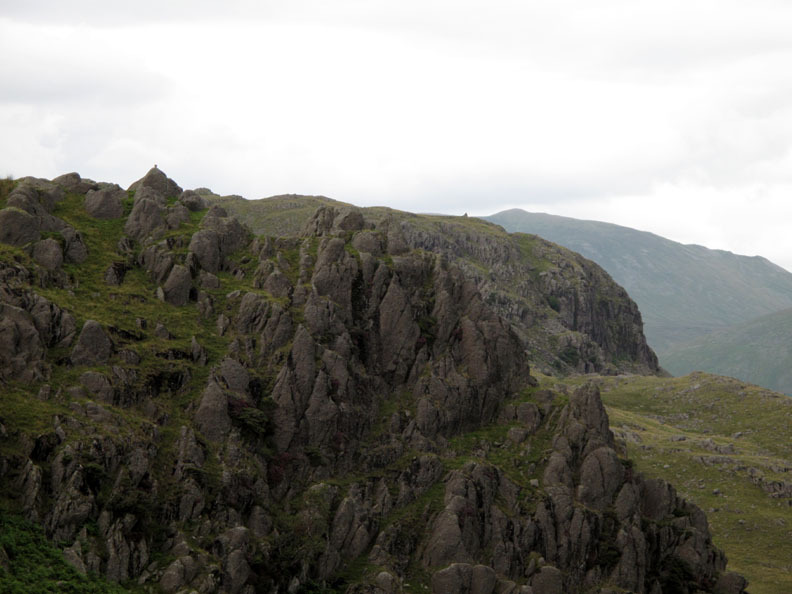 The higher summit crag is the one on the right but the one on the left has a better view. One last pull up to the summit up the steep grassy climb. and so we walked over to find somewhere comfortable to sit and enjoy our lunch. 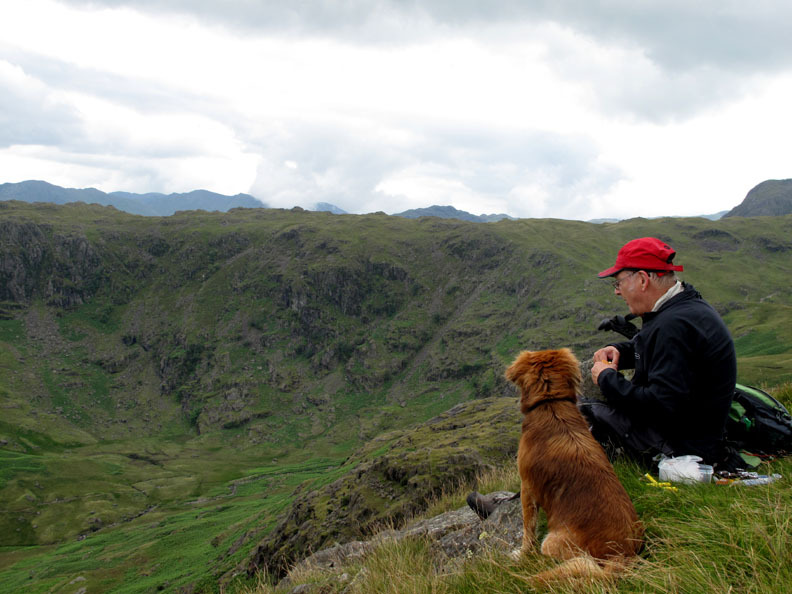 Looking across to Eagle Crag and Blea Rigg from our perch on the edge of Tarn Crags. 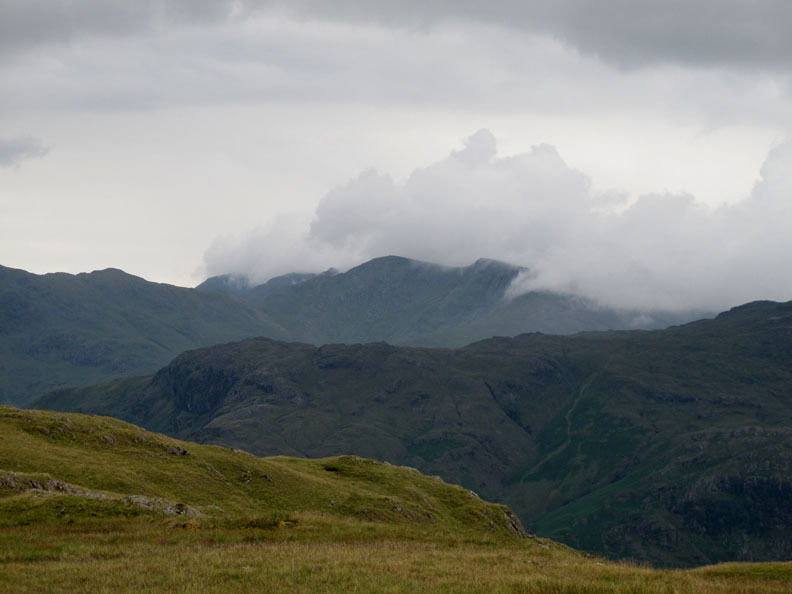 In the distance cloud gathers on the Coniston Fells but our summits are clear. 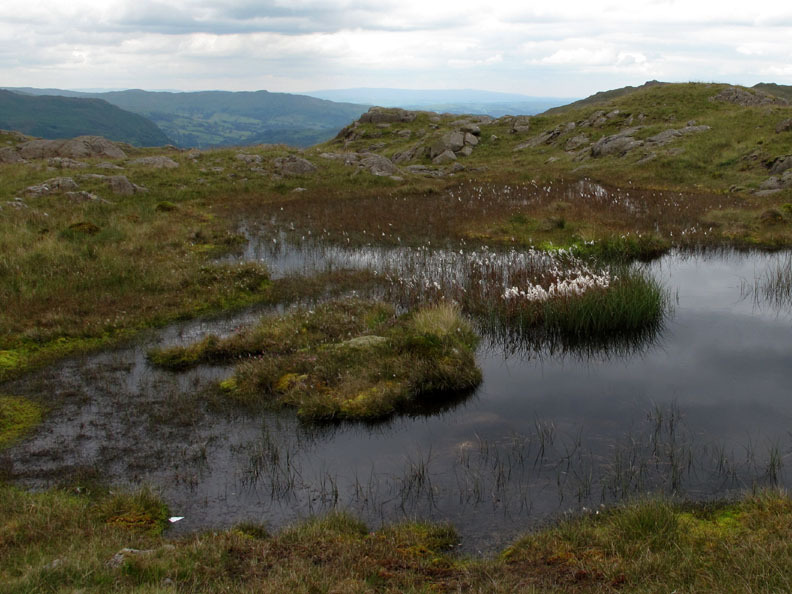 Below is the complete view of Easedale Tarn . . . and south towards Windemere. 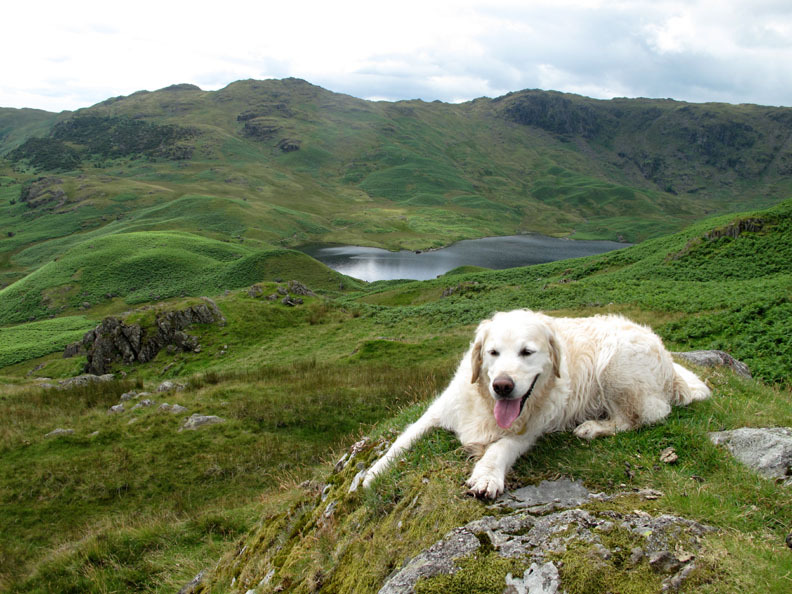 Lunch over, our route now takes us across to Codale Tarn, a first for Ann and I. We have often seen it before but never visited. 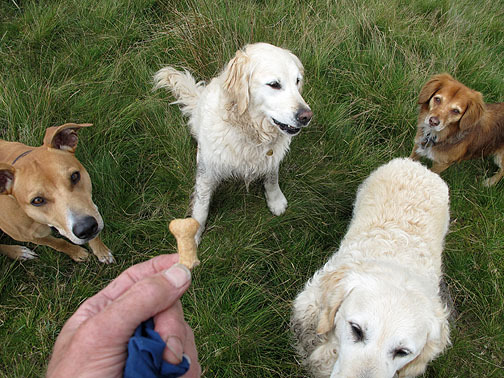 Magnetic dog biscuits . . .
. . . a snack time photo shoot !
. . . still you get the idea . . . never work with children and animals ! Rather bedraggled Cotton grass on a moorland pool on the way over to Codale Tarn. The lack of breeze today has its compensations in the form of a lovely reflection on the calm waters. Long leafed water plants create decorative effects across this eastern end of the tarn. 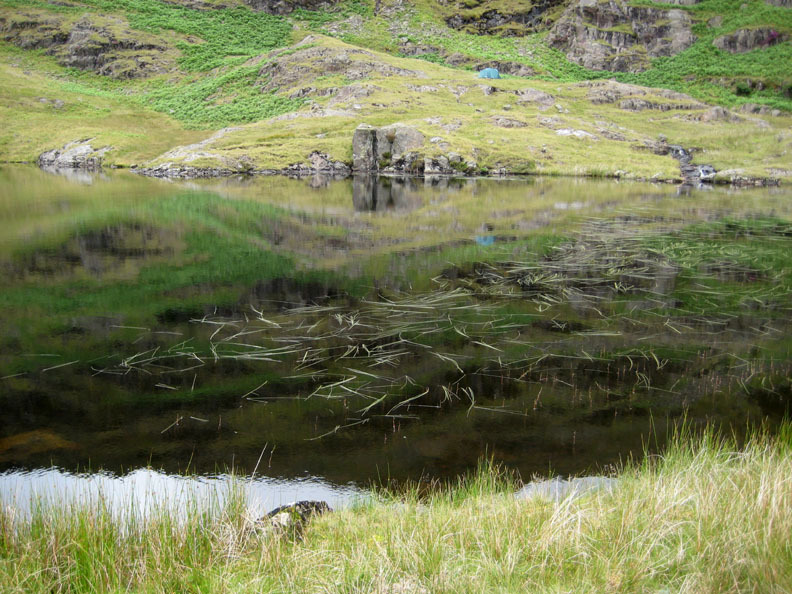 Note the reflection from a wild camp tent on the opposite shore . . . no-one at home though, just the tent. The reflections were suddenly spoilt by the arrival of his lordship. 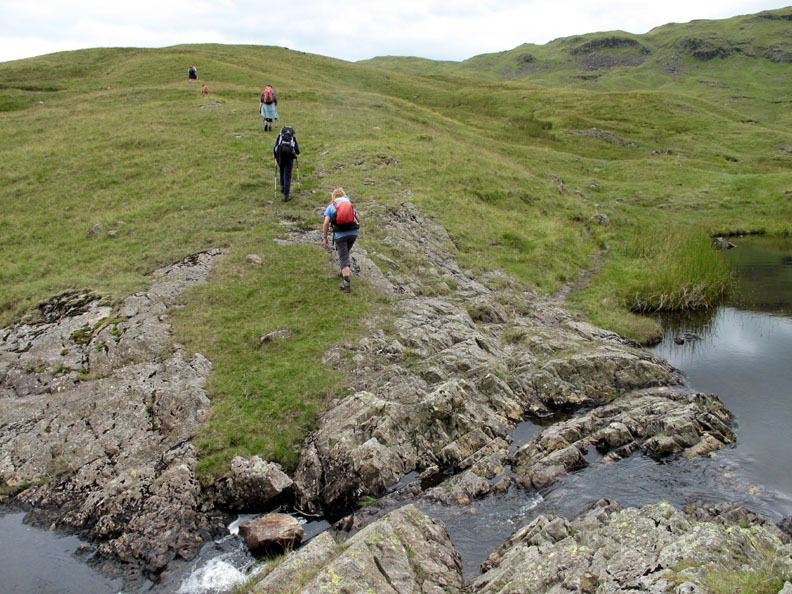 Crossing the outflow from the tarn and heading up grassy Belles Knott. 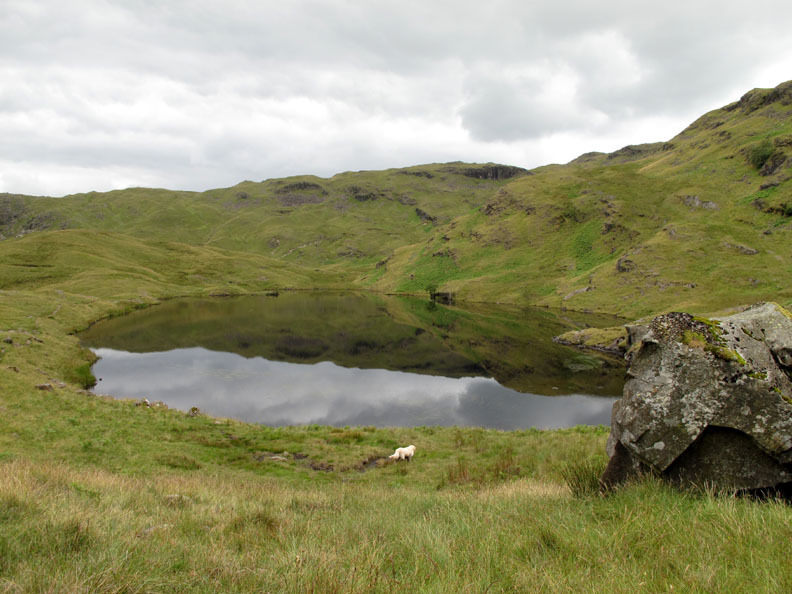 Looking back across the tarn. I diverted around the water's edge a little further before joining the others. yet a craggy southern face where the rocks were plucked away by the moving ice as it made its way down the slope. 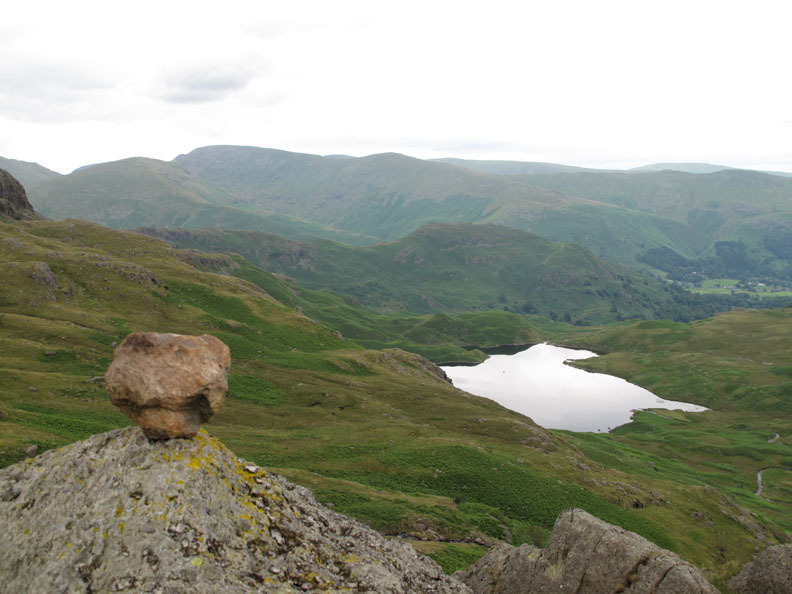 One stone was left behind which was given pride of place on the highest rock. 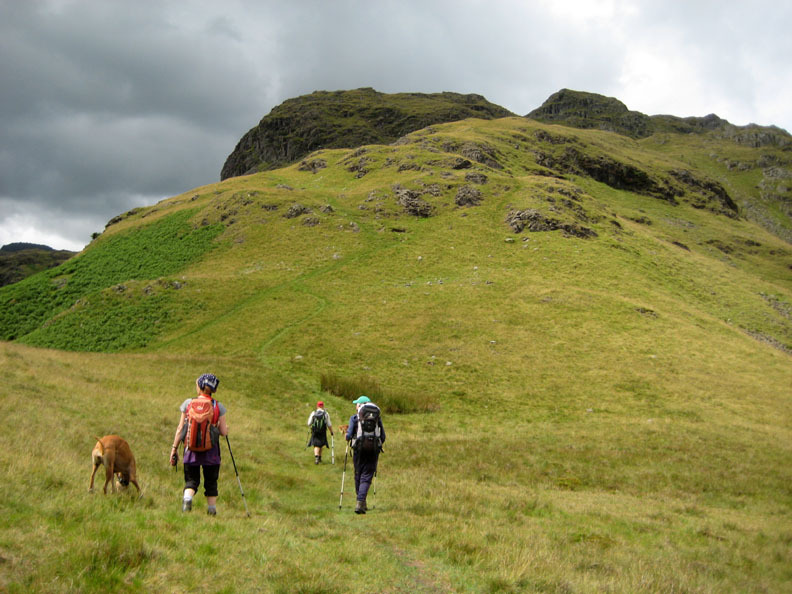 A thick dark cloud casts a deep shadow over Belles Knott as we cross the Easedale Tarn path and head up Blea Rigg. 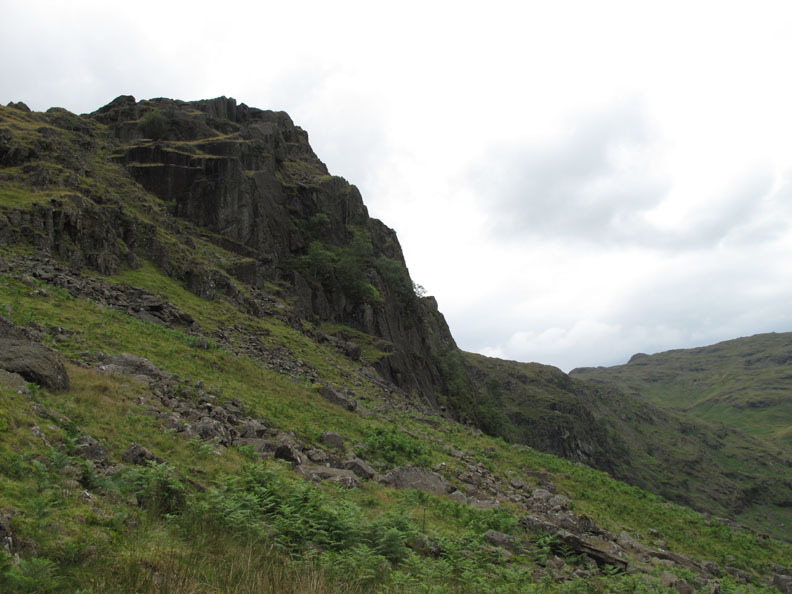 The craggy outcrop of the southern face which is very distinctive from the valley below, can be clearly seen here. and behind it, the summit of Dollywagon Pike on the southern section of the Helvellyn Ridge. 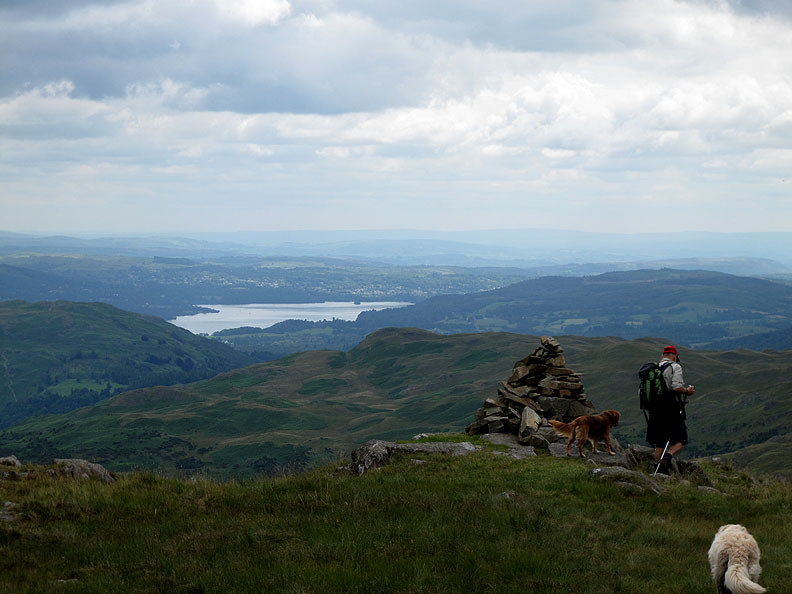 Fine views across the to Coniston Fells. Our recent dark interlude came to naught but the high ground to the south west had a covering of cloud for much of the afternoon. 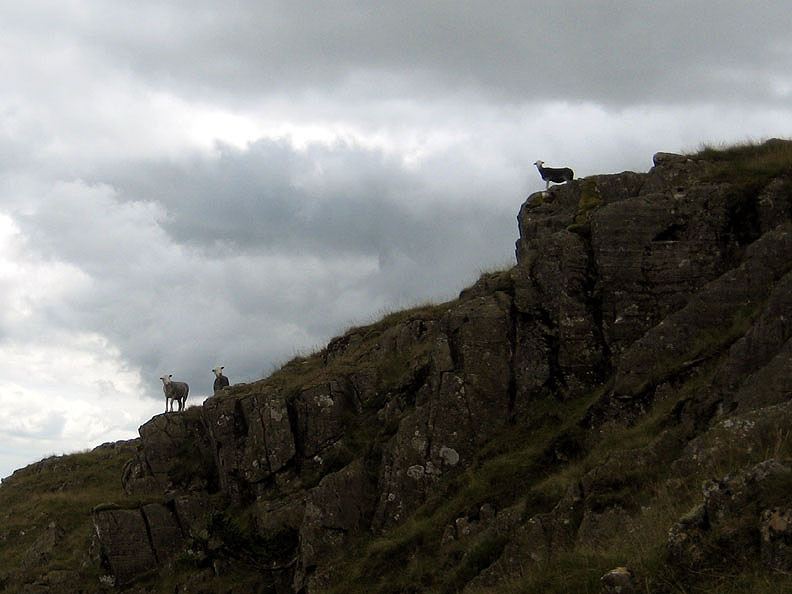 The summit of Blea Rigg, the highest rock outcrop of several down at this end of the ridge. 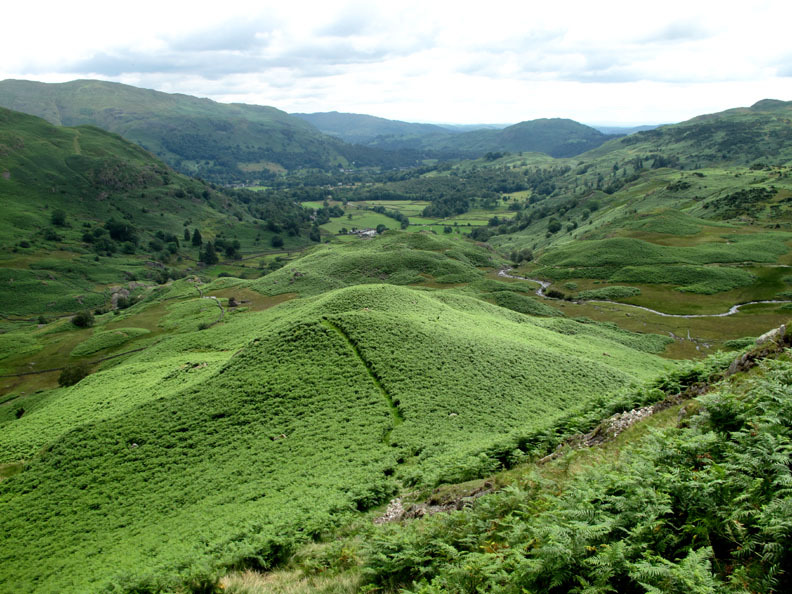 The fell gets its name from the Blea Crags overlooking Easedale. I don't know what happened to Harry here . . . I think he's shrunk after being in the water ! I took it anyway . . . click here or on the photo above for your chance to see it in full wrap around vision. Stop Press: We have received the following replies from your fellow Loweswatercam viewers . . .
"Stop calling me Jim Callaghan"
He's complaining about . . . the state of the Euro. He has a suitably serious look on his face ! Keep up the good work. Best Wishes, Rod Hepplewhite. 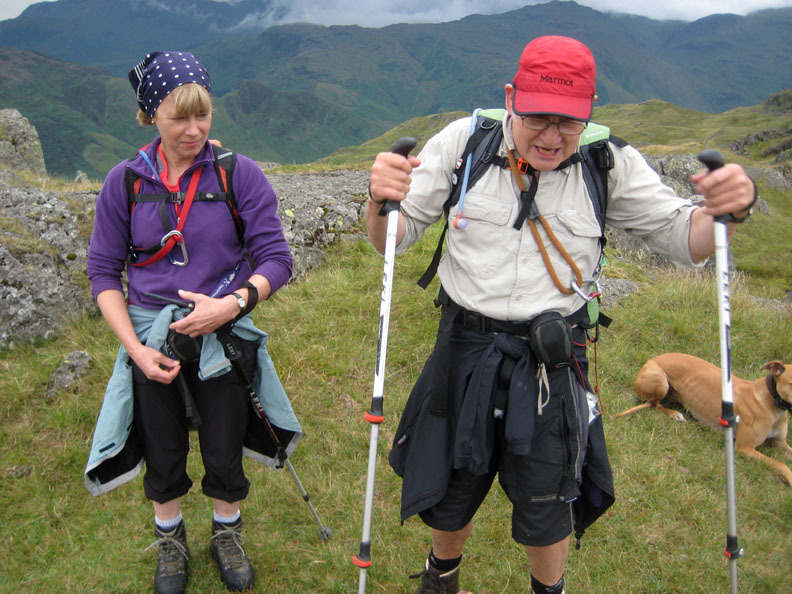 On Blea Rigg I think that John is saying: "I'm sure these Leki poles were shorter before lunch!" Another overcast day with obviously a good walk. 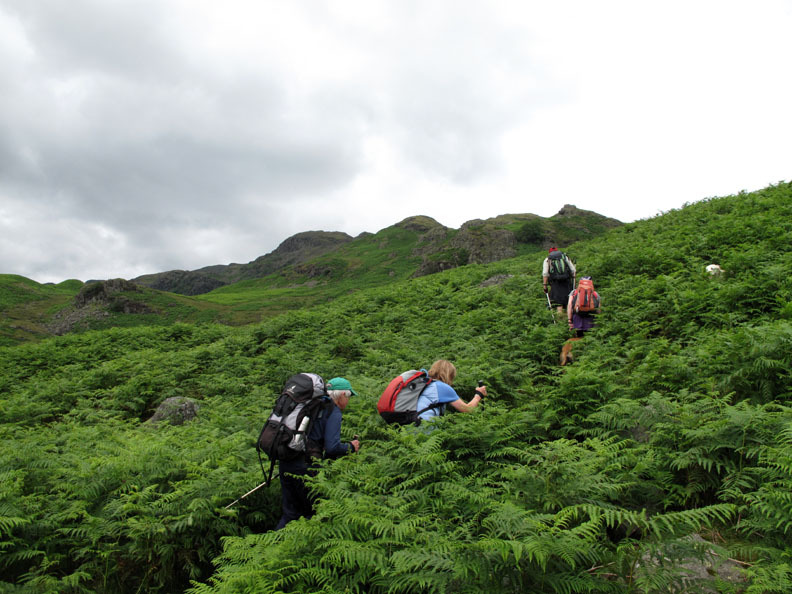 Orientation must be difficult in the bracken, which seems to obscure paths. What John is saying we do not know, but Jo´s sorrowful face tells us a lot about it ! 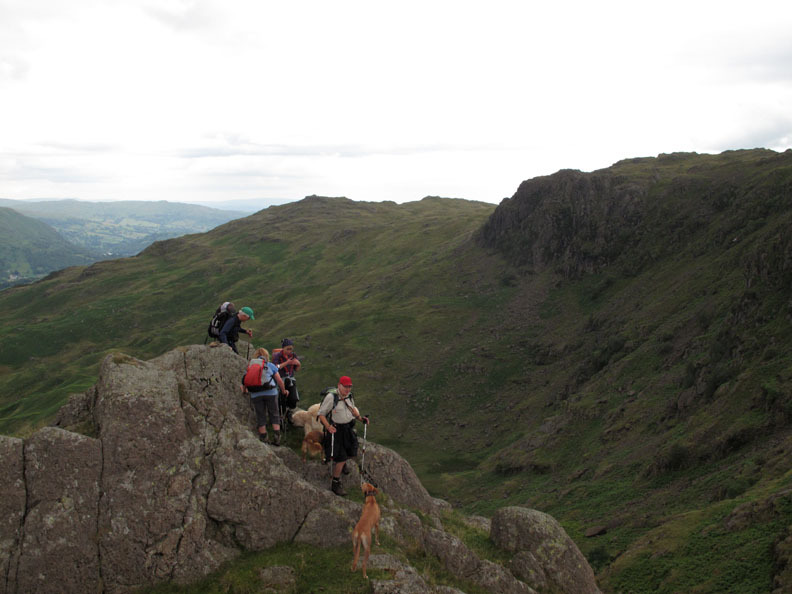 A slight grassy scramble brings us down from the summit of Blea Rigg. 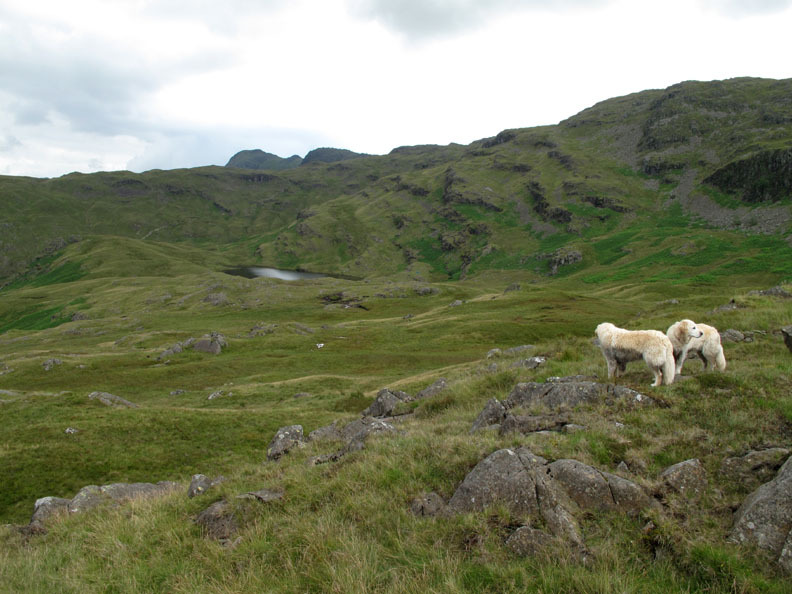 We're looking for the track down to Easedale Tarn, not the main one which continues on to Silver How. so the first confirmation of finding the path was this small cairn. Once we were on it, it was easily followed. Blea Crags with Sergeant Man just about to disappear behind the ridge. 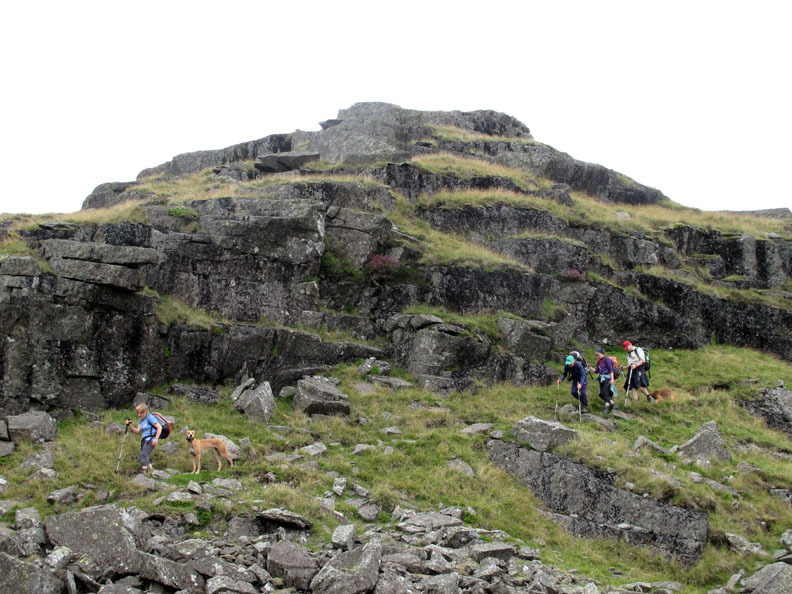 The main summit of Blea Rigg is set back some way from the edge of the steep drop. 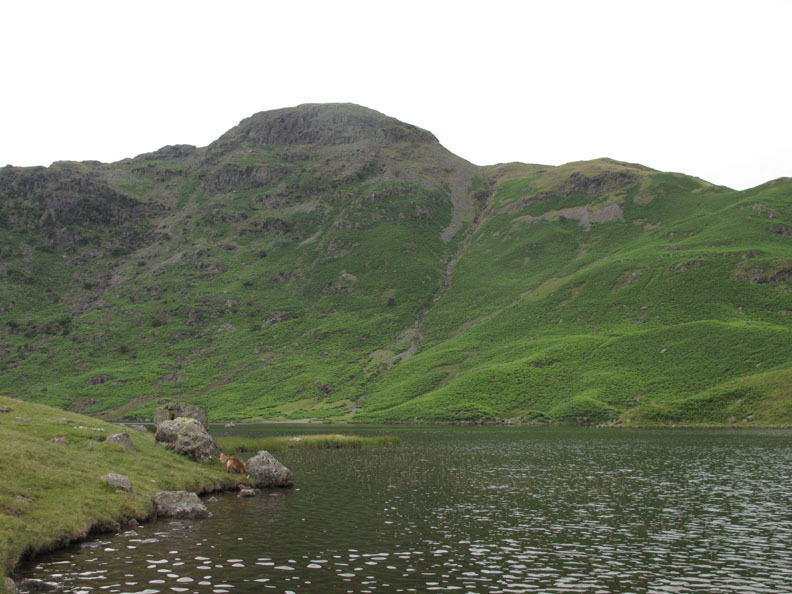 Down at Easedale Tarn now and looking across at Tarn Crags . . . where we had lunch a while back. 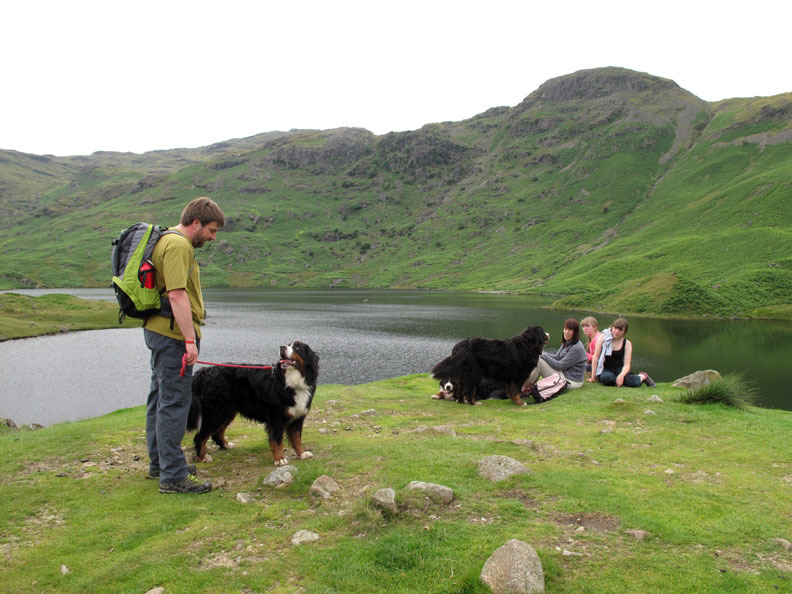 While we were there with our four dogs, a family walked up with their Bernese Mountain Dogs. 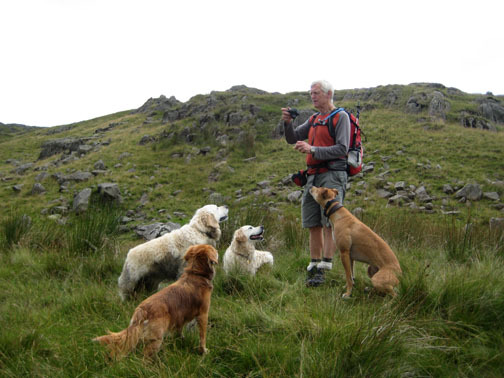 The three lovely dogs were all from the same litter and were really enjoying their day out on the fells. 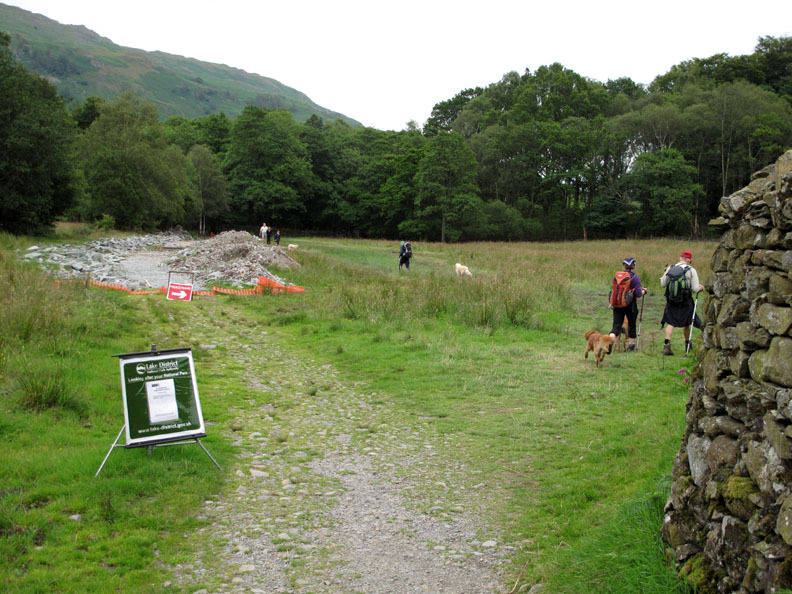 as there's still a way to go, seeing that we parked the other side of Grasmere Village. 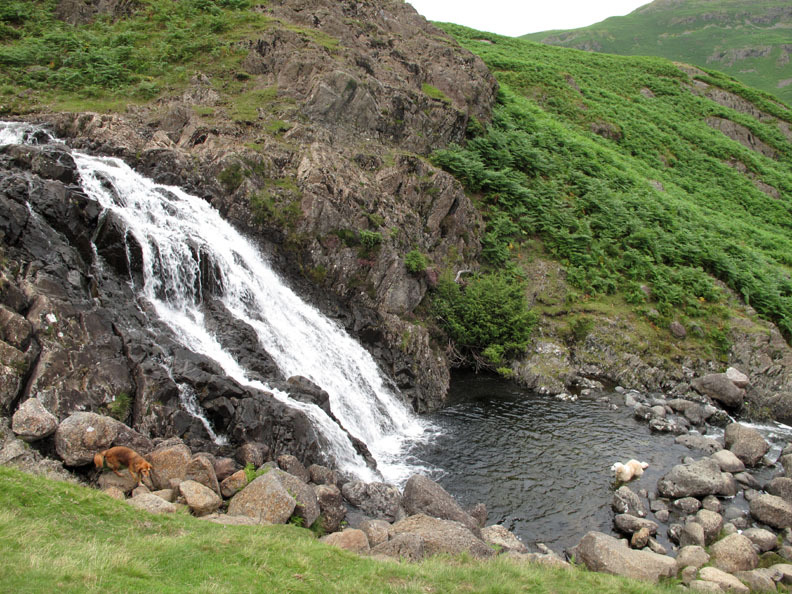 The top falls of Sour Milk Gill . . . I wonder where Harry is ! but can be seen nicely from this old gate way lower down. Crossing over the old bridge and it's just a road walk back to the car. As a result there is some major re-building underway. The following pictures may act as some sort of archive to compare with photos from this area at a later date. The National Park guys are doing a major rebuild on the track across the meadow. 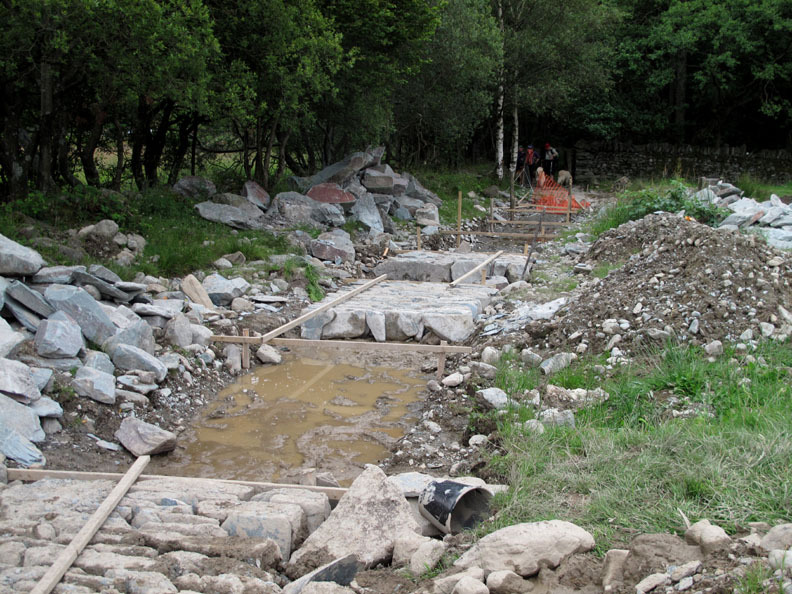 The path has been mechanically excavated and is being re-laid by hand, section by section. They've unearthed some primitive tools in the dig . . . and are using them to relay the path in traditional stile. This site best viewed with . 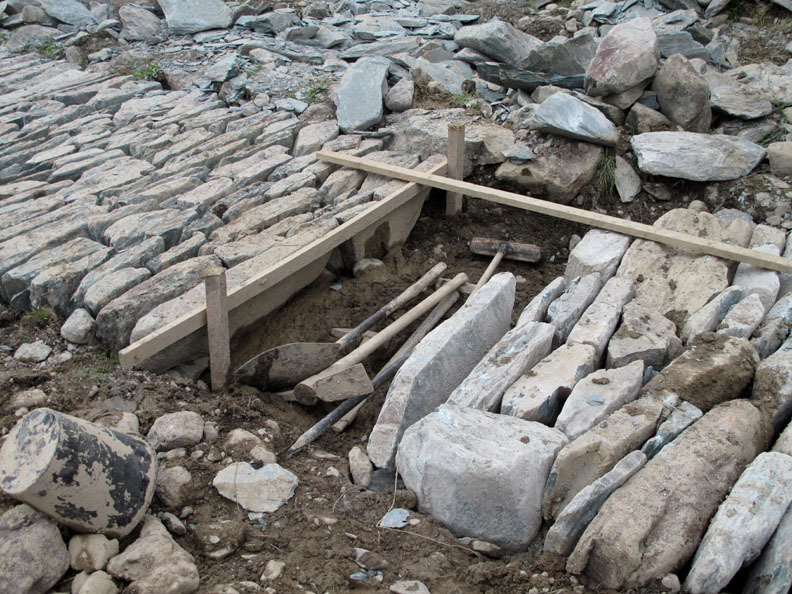 . . more use of hand tools and NO EXCAVATORS on the high upland path repairs. Click here for John's pictures of the day.